Can't get any more touristy than that. 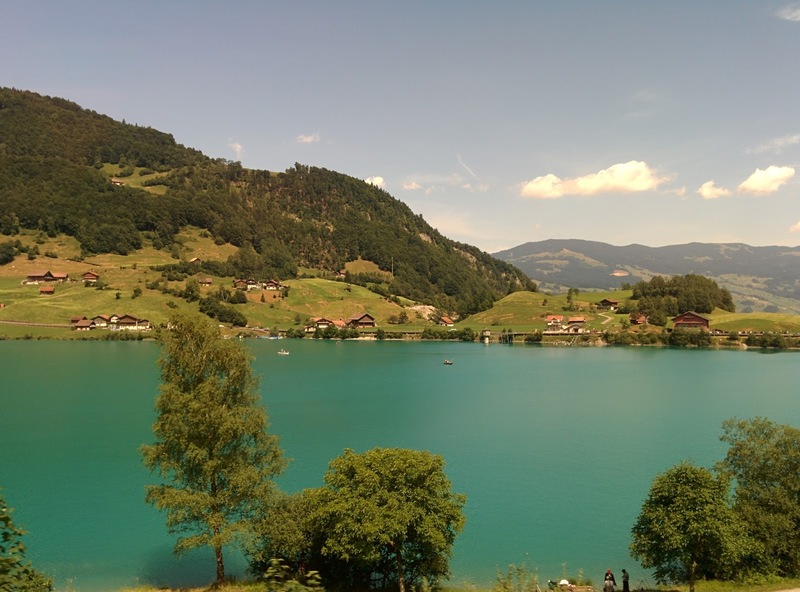 Following the massive success of the movie Dilwale Dulhania Le Jaayeinge in India, Switzerland is a dream location. So when we were making plans to go there, I really didn't feel up to it. Now that I've been there, I'm glad I did. I have never seen anything like it. 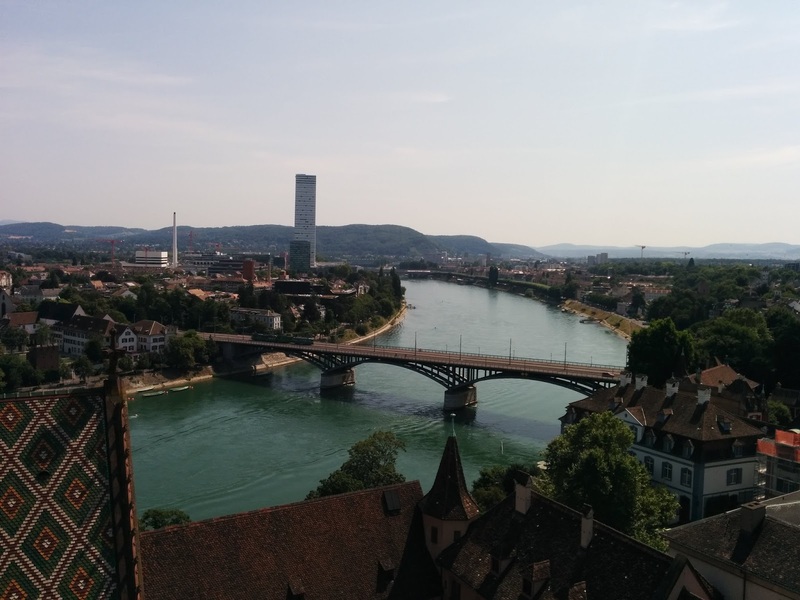 We landed in Basel on Saturday morning and needed to get to Luzern. Before we took a train, we quickly went up the Munster (or the cathedral) to get some views of River Rheine and the city. Here is a picture. 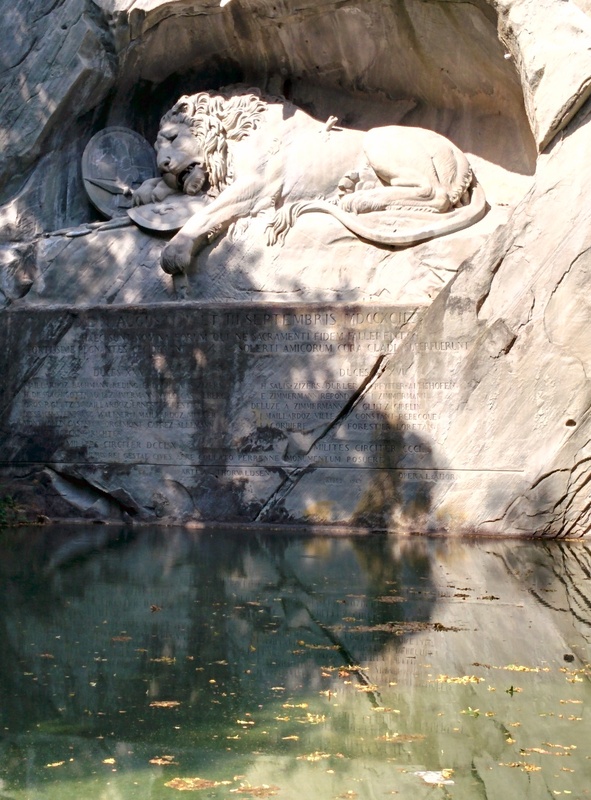 Soon we reached Luzern. There is a free walking tour of the city starting at the station that we wanted to take. But unfortunately we got the timing wrong and we missed it. It's at 1.15 pm on most days. We weren't too disappointed though, it is not advisable to go walking around in the middle of the day under the sun, when it's 30 degrees. And we also woke up real early for the flight so we slept for a couple of hours and then explored the city by ourselves. They have this dam made of timber needles that's really interesting, a wonderfully detailed sculpture of a dying lion and the most famous landmark is this beautiful bridge. People go to Luzern to go to Mt Titlis. But if you are not going there you can skip the city altogether. It's pretty but just another pretty European city. 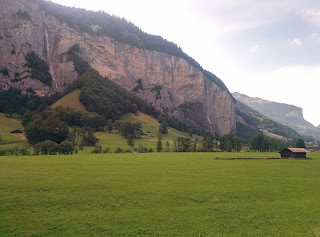 We then took a connecting train to Lauterbrunnen, a valley in the Swiss Alps known for its 72 waterfalls. We had pretty much the whole afternoon with us. So we grabbed something to eat, stuffed our luggage in a locker and jumped on a funicular to Grutschalp. At Grutschalp we changed to a train to Murren. Murren is high up on the mountains and had great views of the Alps. We walked from the train station to another funicular station. This is where you would catch the funicular to go up Mt Schilthorn. 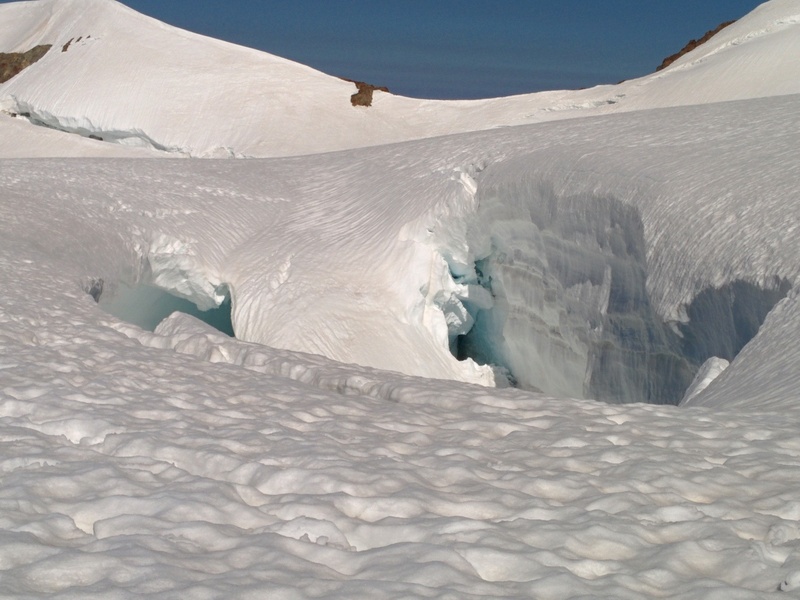 In summer though, it's unlikely to have much snow. So we didn't go up. 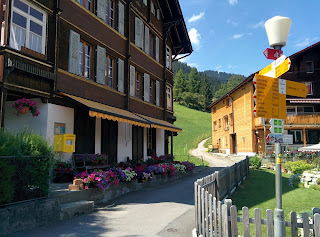 Instead we took the funicular down to Gimmelwald which is tiny unbelievingly pretty village. Here is a picture. 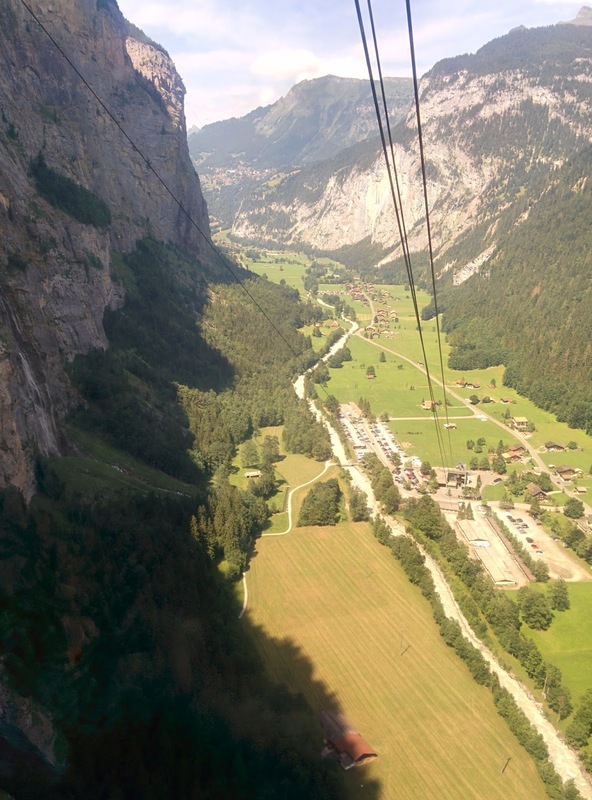 Then we took the same funicular to Stechelberg. It moved so fast that I had mild vertigo and had to sit down. Check out the view that freaked me out. 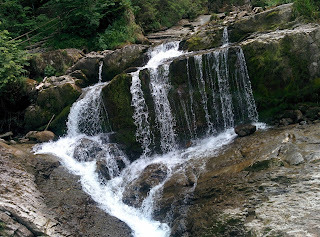 We stopped moderately at Stechelberg walked around a little and took the bus to Trummelbach falls. This is a breathtaking natural beauty. The waterfall keeps cutting the mountain with every twist and turn with such force, it's glorious. I would highly recommended it. I do have a picture though it's hard to understand from it. When we got to our hotel we had issues with it that I have elaborated at the bottom so as to not upset the flow of natural beauty here. Practically pretty much all hotels have a view of some or the other waterfalls. Here is a view that I woke up to the next morning. The next day, Day 3, we had planned to go up Jungfrau and woke up at 6.30am. 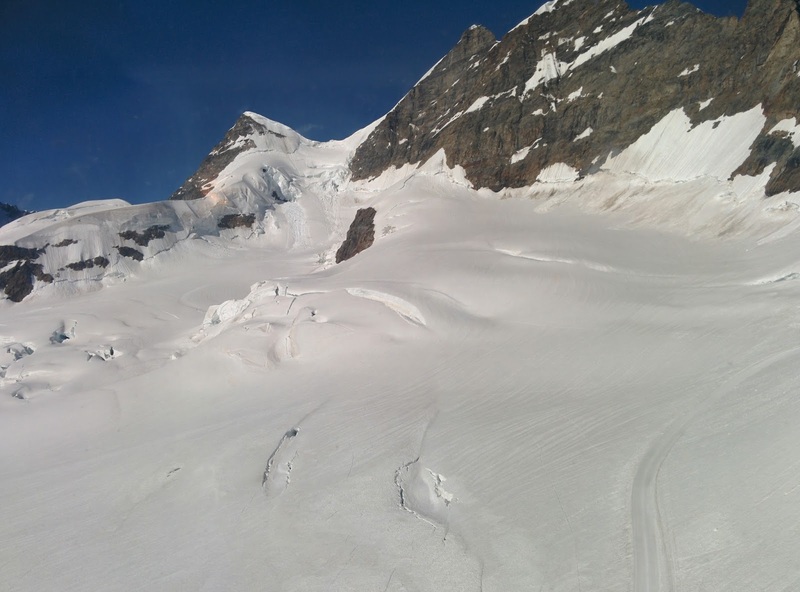 But the webcam on the top of Jungfrau showed a fully clouded summit. You can see it here So we decided to sleep some more and go to Jungfrau the day after. We woke up later on and took a train to Interlaken. 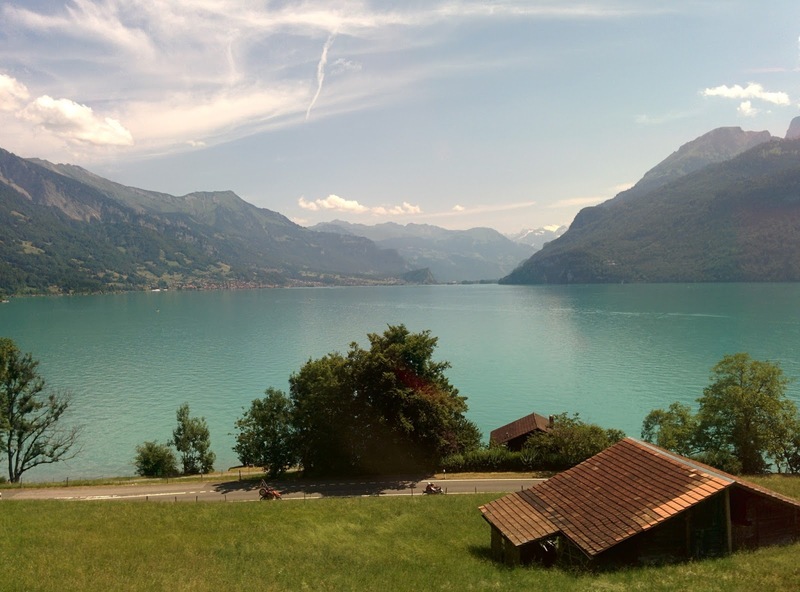 Interlaken is a smallish town which serves as a transportation hub. We directly headed to Flying Wheels to hire some incredible e-bikes, that we totally loved after Tenerife. 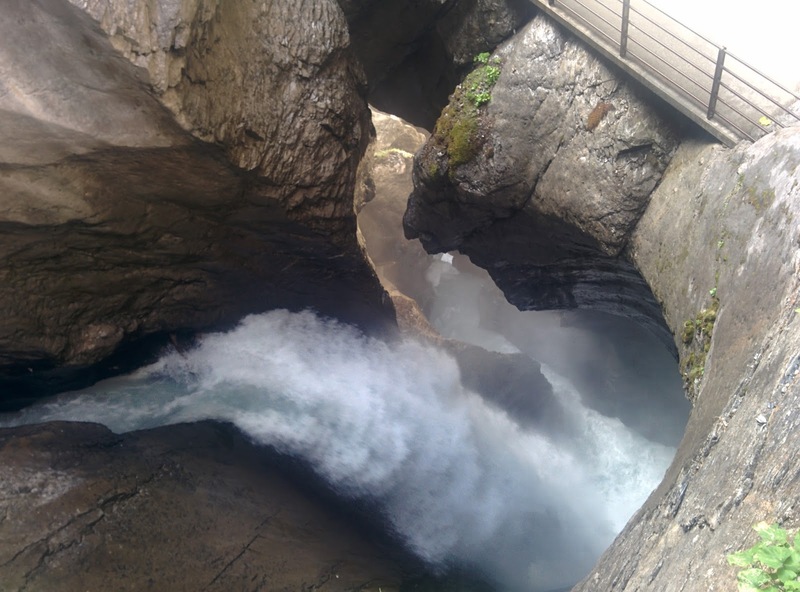 We cycled around the lake Brienzersee from Interlaken to Islewald, had a light lunch and then cycled to Giessbach waterfalls which was a bit of an edgy ride. From then it was pretty easy ride to Brienz where we took a train back to Interlaken. The cycling route was around 25km. When we reached the hotel we were tired and the bed was comfortable. 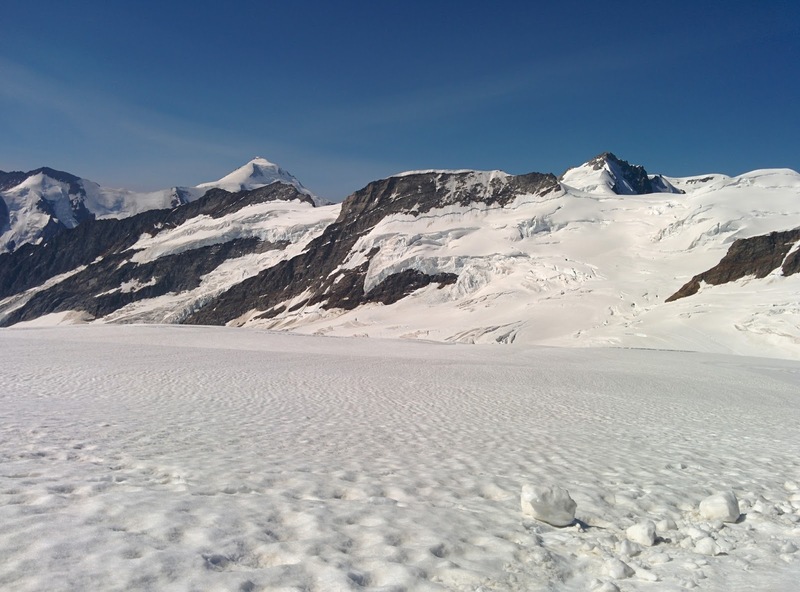 The next morning we woke up at 5.30am and checked the webcam to see a beautiful sunrise on top of Jungfrau. We woke up early because we wanted to take the first train out so we can avoid the tour groups as well as get a considerably cheaper ticket. 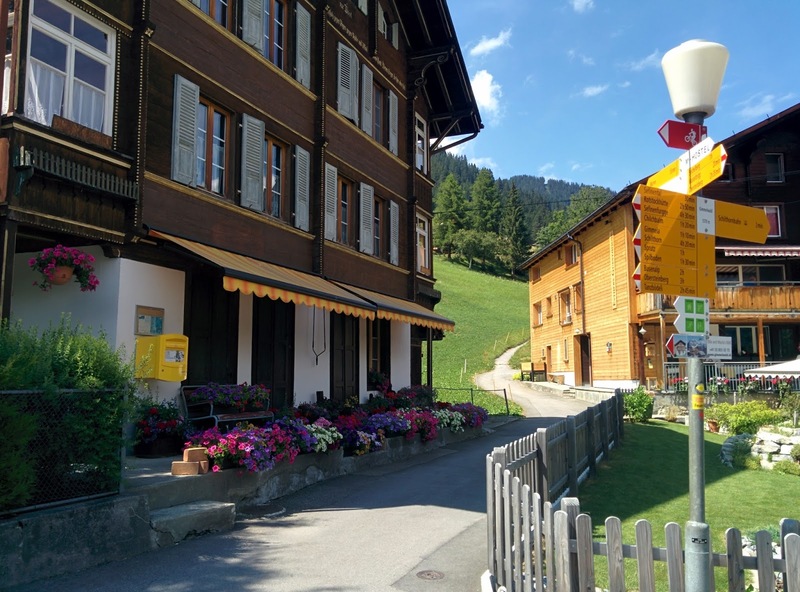 We started our journey from Interlaken West to Interlaken Ost where we split ways so one of us could put the luggage in the locker and another could buy the Good morning ticket all in 10 minutes. Then we took a train to Lauterbrunnen and connecting train to Kleine Shiedegg and then a connecting train to Jungfraujoch which is col between Mt Jungfrau and Mt Monch. We took the first train out and reached Jungfrau at around 9am. On the way the train stops to show us some view points like this. The train actually goes through the mountain itself so there isn't a view except at the view points. These pictures are incomparable to the actual view once you get there. 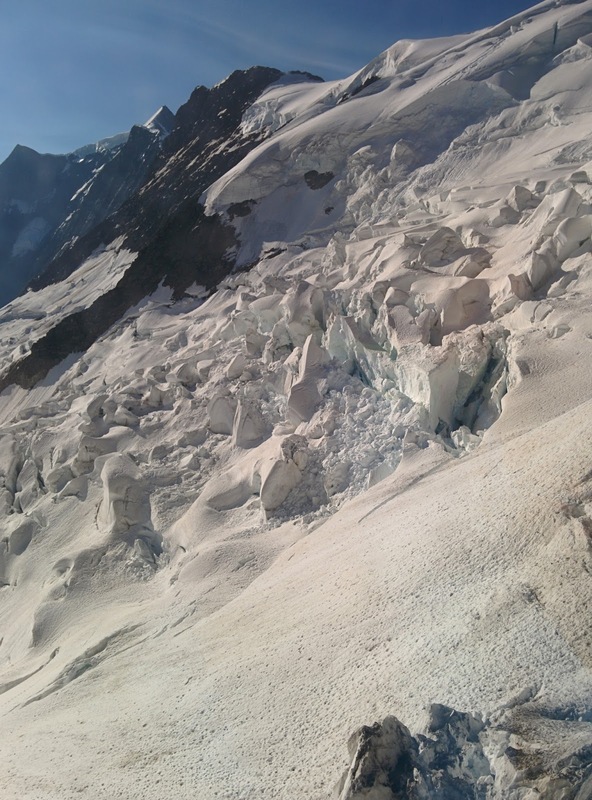 At Jungfraujoch there is a small tourist centre with some fun things, restaurants, shops and a viewing station called the Sphinx. Everything was shut when we arrived so first we went to the Sphinx and took a couple of snaps like this. After walking for about 20 mins we asked another fellow walker (or hiker) where this path leads and found out it's to a hut where you can get some hot chocolate. It was 2 degrees so the prospect of a hot chocolate led us on. 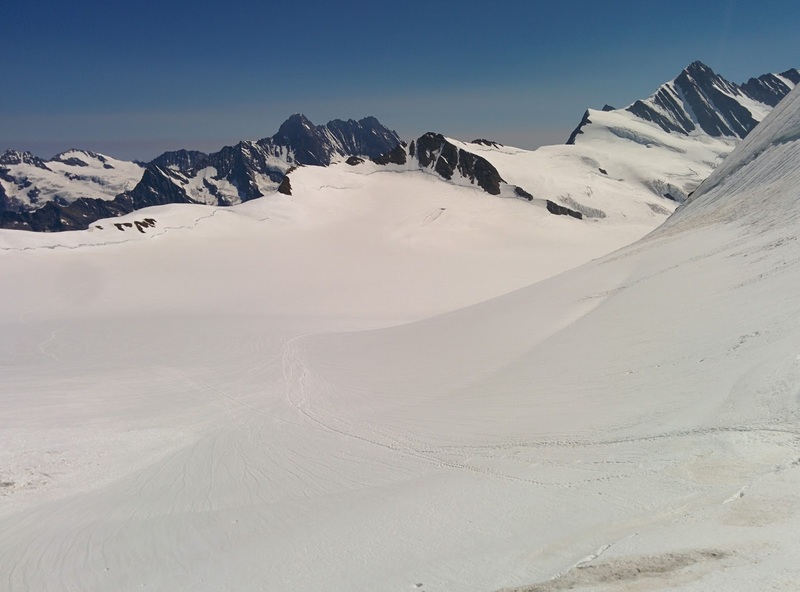 Ultimately, it took one hour in all to get to the hut, Monchsjoch hut, literally in the middle of nowhere at 3,658m altitude. It had heating, great soup, awesome hot chocolate and a divinely spectacular view. 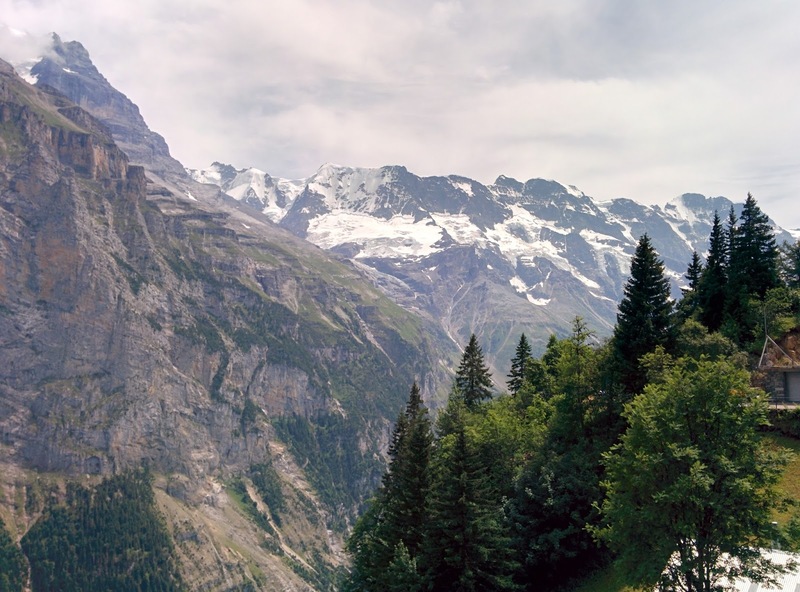 This view justifies our entire trip to Switzerland. I have a photograph here but doesn't come close to what you see. 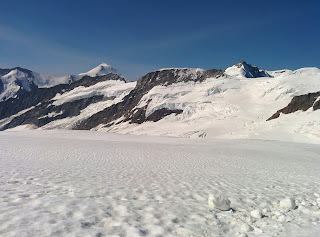 Then we trekked back within 30 mins and by the time we reached Jungfraujoch it was bustling with people and some snow games were setup. You can do sledging, tubing etc but we had to leave quickly because we needed to catch the 1pm train which is the latest train you can catch with the Good morning ticket. 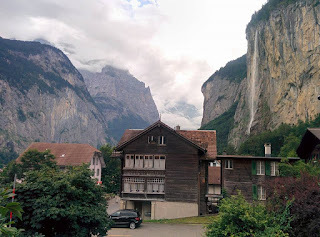 As I was saying, the experience with the hotel in Lauterbrunnen was really poor. When we got there the hotel wanted to charge us to check in even though the room was already booked and paid for. To be sensible, even if you didn't pay ahead, hotels charge you at check out and not check in. But our hotel insisted we do and they didn't have clear systems. They see the booking but claim it's not paid for. Their card machine they said, is not working and then charged my card on some different hotel and gave me a bill with a different credit card number and where the additions and subtractions actually don't make sense. We argued till we got a bill at least with my credit card number. By now I was convinced they are frauding me. After I returned to London I called the booking agency who spoke to the hotel about the booking. After 5 phone conversations and multiple denials and 10 days, I still haven't got the money back but at least the hotel has finally agreed that I was double charged and said they would refund. Fingers crossed. Update: 8 phone calls and 28 days later, no update. Update: my credit card company gave up on trying to get the refund because all they say is the person incharge of refund is unavailable and will be here tomorrow at 4pm, a tomorrow that never comes. So my credit card company refunded my points that I used to book the hotel. So no loss to me except hours of phone calls. But the hotel kept my money and the points!!! Hotel Schuetzen Lauterbrunnen is the name.